When right-wing Roy Moore said that the time when America was great was during slavery, he revealed something key to the current GOP members of Congress and state legislatures--their primary goal is to return to a time when owners of property held all the keys to the kingdom and workers were just serfs expected to do as told and whose lives didn't really matter much to the boss capitalists. Historian Nancy MacLean suggests that this is the reason for the tax bill's largesse to corporatists and the wealthy, the reason the GOP wants to undo Medicaid, Medicare, Social Security and essentially all the progressive programs introduced in the twentieth century to form the basis for a thriving middle class and surging democratic union. See Cahuncey DeVega, Historian Nancy MacLean on the right's ultimate goal: rolling back the 20th century, Salon.com (Dec. 13, 2017). Here are some key points from the article. 1) "[T]he Democratic Party is terrible at translating complex questions of public policy into simple narratives that evoke emotion and, in turn, action from the American people." Id. Indeed, having an able, sympathetic messenger who can translate the issues that truly matter into terms that make sense to ordinary people is something the Democratic Party lacked in the last election. The tone deafness of Debbie Wasserman Schultz and, much of the time, Hillary Clinton, meant that ordinary people didn't understand that Trump is merely a blowhard capitalist who doesn't care if he cheats or lies or exploits other people so long as he gets notoriety and money, while the Democrats have been the party working for a decent sustainable economy, environmental protection and preservation, protection from pollution and diseases, and working wages for ordinary folk. The GOP, on the other hand, has mastered the art of lying to the point that they can pat themselves on the back for fooling the majority of the people the majority of the time, while blaming anything that goes wrong on Democrats (even when it is--most of the time--entirely GOP policy that the 'wrong' occur). So a tax bill that enriches the oligarchs and ultimately raises taxes on the ordinary people is exactly what they have in mind, but they rush it through without any public hearings and discussion because they don't want people to realize it. 2) The GOP tax "reform" bill is intended to create a deficit that will justify "huge automatic cuts to Medicare, Social Security and Medicaid", to be followed by a "push for a constitutional convention, at which the No. 1 agenda item will be a balanced budget amendment" with the goal ultimately of privatizing Social Security. MacLean calls this Ayn Rand-brand of hateful thinking followed by GOP House majority leader Paul Ryan "economic eugenics". Since the GOP right-wing libertarians believe that only people who are successful have any merit, they are comfortable "inflict[ing] harm on other people. At its most basic, this libertarian moral system says that it would be better for people to die than to get health care financed by government from taxes paid by others." 3)The GOP emphasis on voter fraud (and consequent efforts across the country to make it harder for people to register to vote or to actually vote) allows the oligarch-led anti-democratic movement to disregard the will of the people because they have "gamed the system to maintain power." The majority of Americans opposed the tax bill that almost every single Republican representative and senator voted for (no Democrat voted in either house of Congress to support the GOP tax scam). But the GOP legislators think they can ignore what the voters want, because they have held discussions behind closed doors, and are "using the power of national government to prevent voters in more progressive lcoalities and states from being able to choose more progressive policies" by enacting a bill that penalizes voters living in high-tax, progressive states that actually already send more money to low-tax, economically suffering "red" states. MacLean notes that George Mason University's Mercatus Center, funded by Charles Koch, has been leveraging universities for their political project of undoing progressiivism for decades. They think people will be "absorbed with Facebook and binge-watching Netflix" so will disregard the way that the GOP and their oligarchic allies are using the national government to return to the late 19th century when oligarchs with property had all the power. That's what is the "stealth nature of this tax bill." Returning to a world where "only the wealthy were doing well and everybody else was screwed", a world preferred by James Buchanana, who "devised the playbook that the Koch network is using." This tax legislation is, indeed, class warfare. It represents a huge blow in favor of wealthy corporatists though creation of a gaping $1.5 trillion deficit hole that will be used by the GOP to decimate New Deal and Great Society programs on which most ordinary Americans depend --Medicaid to pay for nursing homes in the last years of life, Medicare to help afford needed medical care, Social Security to make up for the gap between the meager savings in retirement plans and the increasing costs of living after retirement. These wealthy people in Congress just don't give a damn for ordinary working Americans, whether black or white, rural or urban, "conservative" or "liberal". All they care about is making sure that people with property have even more property. It has nothing to do with creating or promoting a sustainable economy that will lift ordinary workers stagnated wages. It has everything to do with appeasing the top one percent. The GOP's tax-complicating, deficit-increasing, wealthy-subsidizing, Arctic destroying, Health Care damaging, $1.5 trillion tax "reform" package is unpopular with most Americans, destructive to the government's ability to fund needed programs from disease prevention to FEMA to basic research to needed infrastructure improvements, and wildly popular with the wealthy GOP donors like the (oil-rich) Koch Brothers, the Mercers, the Wal-Mart heirs, etc. So why did GOP representatives and senators vote for this bill that most of them hadn't read and didn't understand? Back in early November, one Republican in the House was surprisingly honest about his reason: his wealthy GOP donors told him to get the tax bill (that favors the wealthy) passed or don't ask for campaign assistance. See Bob Bryan, Top GOP Congressman: my donors told me to get the tax bill passed or 'don't ever call me again', Business Insider (Nov. 7, 2017). The House passed the awful "tax complication bill of 2017" on Tuesday. The Senate had to make a few changes because it didn't comply with the Byrd rules, and then will presumably pass it today. It'll go back to the House where the HOuse will then take the final vote on the Senate changes and send it to Mr. Trump for signature. The GOP will claim that they have singlehandedly put together a marvelous tax cut package for the middle class. That is a pack of lies. The tax cut package redistributes upwards--it is a marvelous cut for the wealthy (the estate tax reductions costing about $200 billion over ten years, the corporate tax reductions (including increased incentives for offshoring while lowering the top corporate tax statutory rate (higher than most corporations ever paid) to 21% from 35%, the lowering of the top individual rate from 39.6% to 37%, and a 20% "deduction" from taxable income for "qualified business income" for owners of businesses (whereas workers with the same earned income don't get that nice little subsidy, based, it appears, on Mitt Romney's keen disregard for the large group of American workers and working poor that he labelled "takers" compared to the regard he had for the wealthy capitalists, who he labelled "makers", etc.). It is a piddling cut for most non-wealthy individual Americans, especially those who live in "blue" states and already contribute more tax money to the federal government that is transferred to "red" states. And the corporate tax cuts are permanent while the individual tax cuts go away at various times over the next decade. What's more, it is rather doubtful that most of those voting for this bill in the House and Senate even know what is in it or how it will impact different types of families and workers. The Huffington Post reported that several GOP congressmen couldn't say what the bill's new tax brackets were hours before they voted to pass it. See Matt Fuller, Twitter Account (asked Kevin Brady to name them, said he could, but either wouldn't or couldn't, and 11 others couldn't). And mostly they disregarded the overwhelming majority of Americans who are against more tax breaks for the wealthy and big corporations. This bill is being rammed through without hearings, without a proper Treasury analysis, without the kind of in-depth thinking that is necessary for the many wrinkles that can develop from hasty tax drafting, and with a complete disregard for anyone who has any reasonable objections. Republicans complained about the passage of the Obamacare bill, but they were in on all the committee meetings, they actually impacted the bill in many ways, there were hearings, there were texts of the bills for discussion, and it was just their decision to vote no en bloc. Democrats were closed out of all the meetings on this bill except for one "pro forma" public "hearing" that didn't allow for any real discussion. That is not the way a good democracy works--it is ideology not policy making. What a shame. I assume that the Democratic "resistance" movement will continue to gain steam, as it did with Doug Jones' election and the surprise tied Virginia House of Delegates outcome. I wouldn't have bet that this bill would have any positive impact on corporate growth even if the result had been bipartisan. But I bet now that most corporations will be unlikely to treat the bill as "certain" tax law given the current anti-Trump climate in this country. The bill has even less of a chance of leading to economic growth at anywhere near the stellar rates that Steve Mnunchin and Paul Ryan have gambled on than it did earlier in its consideration. The Republicans, after holding one sham "public hearing" on their conference bill (without any text released) have on late Friday released the text of their (Republicans only) agreed-upon final bill that will be put to a House and Senate vote as early as Tuesday, December 19, even though there is no score from the Congressional Budget Office or analysis from the Joint Committee on Taxation. As a Vox article announcing the release notes, "the bill is a far cry from the simplified tax code that Republicans have long been promising, but it is a substantial reshaping of the nation's tax base." Tara Golshan, Full Text: Republicans unveil their final tax bill (Dec. 15, 2017 6:05 pm EST). the elimination of the corporate alternative minimum tax (AMT), at a cost of about $250 billion in revenues. making the corporate tax changes permanent (and effective without any transition period) while making the individual tax cuts other than benefits for the wealthy like the estate tax changes temporary. When the health care mandate removal is combined with the other provisions, "On net, the poor would actually lose out in all years once this effect is taken into account." Dylan Matthews, The Republican tax bill that could actually become law, explained, Vox.com (Dec. 14, 2017). 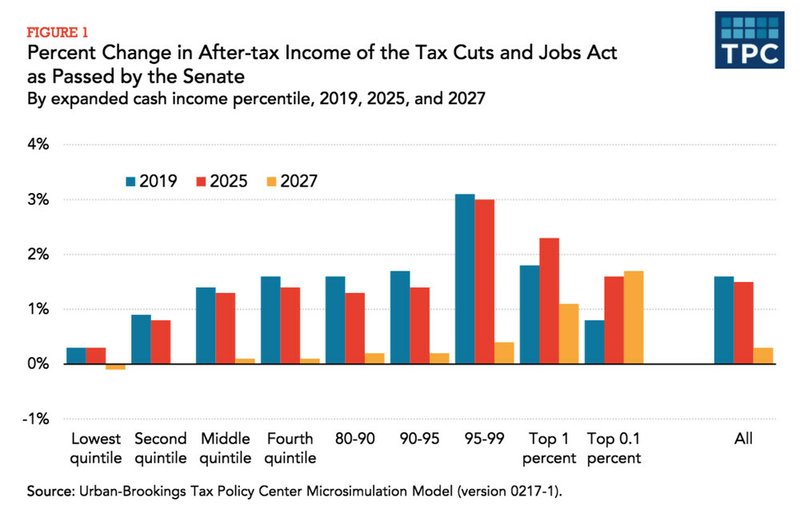 The following Tax Policy Center graph from the Vox article (using the Urban-Brookings Microsimulation Model) shows that by 2027 the top 0.1% end up doing much better (average tax cut for the top 0.1 percent is $221,550 a year). The bottom 20% do worse while the middle--the second and third quintiles--have a very insignificant plus (average tax cut of the third quintile is $490). Within the third or middle quintile, more than 62% of taxpayers that earn between $54,700 and $93,200 would see their taxes go up, "[b]ut only about 0.1% of the very richest one-thousandth of Americans would see a tax hike." Id. Early gains--though small, intended perhaps to benefit the GOP in earlier votes--don't last because the individual cuts aren't permanent. A change to chained CPI for indexing brackets amounts to a tax increase on individuals, while the permanent corporate tax cuts mean rich and very rich do well while middle and upper-middle lose out. Maybe the most damnable characteristic of these House and Senate provisions, other than the sheer favoritism for the already wealthy, is the favorable treatment in determining the rate at which income is taxed for "owners" compared to the disfavored treatment for taxation of workers' wages. As the Tax Policy Center notes, the Senate version of the tax bill "would reduce taxes on business owners, on average, about three times as much as it would reduce taxes on those whose primary source of income is wages or salaries." Paul Krugman, Republicans Despise the Working Class, NY Times (Dec. 15, 2017), at A27. And this dissing of the working class goes along with treating partners in real-estate partnerships (like the Trump family and many other real estate developers) with kid gloves: "a partner in a real estate development firm might get a far bigger tax cut than a surgeon employed by a hospital, even though their income is the same." Krugman, Republicans Despise the Working Class, NY Times (Dec. 15, 2017) (quoting Howard Gleckman at the Tax Policy Center). Pass-through companies, like the Trump Organization, which get a new deduction reducing their tax burden. The House-Senate compromise bill allows people with pass-through income to deduct a portion of that income from their taxes; the deduction is reportedly for 20 percent of pass-through income, less than the 23 percent under the Senate-passed bill. Dylan Matthews, The Republican tax bill that could actually become law, explained, Vox.com (Dec. 14, 2017). Note that this is an off-the-top reduction of what would otherwise be personal taxable income taxed at the taxpayer's individual tax rate. Workers who are paid wages get no such break. And wealthy people will use good lawyering and tax planning to organize their businesses so that their income is counted as pass-through income rather than wages. This is just a continuation of a trend of favoring passive ownership of capital in this country. See, e.g., the Berkeley Blog, Wealthy investors to win bigly with Republican tax plan ( Nov. 9, 2017). Imagine a company where two siblings as owners and a third sibling is the principal employee. They all receive about the same income from the company--for the worker bee, as wages and for the other two, as a profit share. The worker bee does all the creative thinking and working. So the two owners pay tax under this provision on 20% less income than the worker bee. And this is true in an economy in which economists are generally agreed that pass-throughs are currently taxed favorably, taking everything into consideration, and "don't need another break". Dylan Matthews, The Republican tax bill that could actually become law, explained, Vox.com (Dec. 14, 2017). This pass-through provision is as clear a snubbed nose to all those who work hard to earn a decent living as one can imagine. Fact is, the "owners" are often the takers, and the "workers" are the makers. PS. The Vox article suggests that the corporate tax break is justifiable, based on the GOP "economic theory" that claims that a lower corporate tax rate will "spark so much additional investment in the United States that it would bid up wages and leave the middle class better off through its indirect effects." Id. This is just another way to state the "supply-side" "trickle-down" theory that has been relied on for decades by right-wingers but has never been shown to be justified empirically. In 2004, the GOP made the same claim for its "repatriation tax holiday" for multinational corporations, claiming that the low tax would allow those corporations to invest and expand, leading to job creation. It didn't. It led, instead, to share buybacks and more money for the shareholders. In fact, a large number of repatriating corporations that did share buybacks with the money also laid off thousands of workers. The GOP is cruising towards passage of its class warfare tax legislation that continues the long trend of Republican tax policy to redistribute upwards to the very rich. The legislation, however, is supported by a small minority of the American public (latest polls put support for the tax legislation at less than 30%). See, e.g., Allan Smith, Polls show key Republicans could get whacked by the tax bill, Business Insider.com (Dec. 4, 2017). That's astonishing when you consider that one provision in both the House and Senate bills that is used as a "revenue raiser" to pay for the huge tax subsidies to corporations and wealthy taxpayers will be especially hard hitting to lots of middle class and lower-income people, including many who voted for Trump. The legislation will gut the "casualty loss" provision that currently allows taxpayers to deduct losses from hurricanes and fires and other accidents and forces of nature, to the extent those losses aren't covered by insurance (after a $100 per loss limitation). Thus, people who were flooded by Harvey can claim casualty losses on their 2017 tax returns for amounts not covered by insurance. People who lost their homes in the fires that raged earlier this fall in northern California can claim casualty losses on their 2017 tax returns for amounts not covered by insurance. But, as Bob Cesca notes for Salon.com, As L.A. Burns, Republicans Vote for a Tax Hike on the Victims (Dec. 8, 2017). See also Thomson Reuters Tax & Accounting News, 2017 Tax Reform: proposed individual tax changes in the 'Tax Cuts & Jobs Act' (Nov. 3, 2017) and Sally Schreiber et al, Details of Tax Reform Legislation Revealed, Journal of Accountancy (Nov. 2, 2017) (noting that the personal casualty loss is repealed, except, in the House version, for such losses associated with special disaster relief legislation--which requires congressional action for each one); Tony Nitti, Senate Releases Tax Bill: Here's How It Compares to Current Law & the House Plan, Forbes.com (Nov. 10, 2017). You have to wonder just how the Republican Party and Trump administration became so completely heartless. And why they think that Americans won't notice that they only care about multimillionaires in the "one percent". The Republicans' proposed tax legislation--whether the House or Senate version--is despicable. It will exacerbate the already devastating income and wealth inequality in this country, leave the federal government without adequate funds for real infrastructure and social safety net needs, and place in almost inviolable power the wealthiest oligarchs of the country (and even the good ones exert a power that no one should possess in a democracy). My previous posts on this so-called "tax reform" "simplification" package (it is neither) have outlined a number of pernicious provisions in the bills. There are a few I haven't mentioned, such as the likely inclusion of taxation of tuition benefits to undergraduate and graduate students. That will have an immediate impact on education and on basic scientific research. Not surprising, given Paul Ryan, Donald Trump, and Mitch McConnell's aversion to fact-based science and intellectuals, but nonetheless devastatingly harmful to the country in loss of prestige for our universities, loss of the top minds to other countries, and loss of entrepreneurial and innovational thinking that will hamstring commerce and productivity. Another is the "new" talk in the House of lowering the tax rate on the weathiest bracket by as much as two and a half percentage points--adding to the largesse for the wealthy otherwise larding the legislation and making it even more obvious that the only Americans the Republican Party sees itself as serving are those with at least millions and probably billions of net worth. The Republican charade of right-wing "alternative facts" (shown most clearly by the Treasury Secretary's inability to provide a supported rationale for the absurd corporate and oligarch-favoring tax cuts) would have a destructive impact on the entire U.S. economy. And it is not simplification--it is a huge complication that is ripe for tax abusers to abuse the complicated categories of differently taxed income. But today there is a ray of hope that this tax scam might just not get passed --or might get turned around very quickly if it does get passed. Doug Jones' defeat of constitutional scofflaw and likely multiple-sexual-predator Roy Moore should cause any thinking Republican in the House and Senate to take a step back and listen to the views of constituents across the country, where dislike of this tax legislation is the majority view. The #MeToo movement and its impact on powerful media and other industry harassers, together with the fact that Democrats and Independents got out the vote in Alabama and defeated Roy Moore -- and another 20,000 likely lifelong Republicans decided to write-in another Republican name other than Roy Moore--should tell current GOP congresspeople that "the times they are a changin' ". Reaganomics--trickle-down, supply-side tax policies--don't work. Kansas proved that, if anybody actually had any doubt before. If the Republican majorities in the House and Senate pass this " Class War" tax legislation--written and argued and honed to a tee to serve the wealthiest multinational corporations and individual campaign donors while stabbing the middle and low-income classes in the back--they will potentially pay a big price at the polls in 2018 and 2020. They will pay that price because their tax legislation will send the U.S. economy into another tailspin that will lead to cuts in the standard of living of ordinary people so people like the Trumps can have even more gaudy gold faucets in their many mansions. I call on everyone who can to write and call Jeff Flake (Arizona)--ask him to stand on principle and vote against the end of the Obamacare mandate, the giveaway to the wealthy and big corporations, the ridiculous scammable complication of different rates for the same income depending on what job the taxpayer worked at or whether the taxpayer owned the business or was an employee. Ask him to vote down this despicable tax legislation for the good of the country and ALL the people. Do the same for Susan Collins (Maine), who already has expressed real concerns about the impact of the elimination of the health insurance mandate. Even her 'bargained for' (but not actually promised) two-year patch wouldn't do much good: millions of people, the most vulnerable amongst us, will lose health insurance and therefore health care if this tax legislation passes. And let Bob Corker (Tennessee) know how much we all respect him for actually standing firm against this tax legislation travesty--and ask him to stand even taller by resisting the pleas to compromise principles 'just to get a win for Trump'. Let's push our Senators and Representatives to stand tall for a sustainable economy based on fiscal responsibility (don't create a $1.5 trillion dollar deficit) and distributive justice (don't push the middle class into dead-end living conditions) and end the giveaways to the wealthy oligarchs. I predict that if this bill passes the expected accounting for the Republican Party will come even sooner and with even more strength against those who supported Trump's daily vitriol of falsehoods and the Trump Administration's filling the DC swamp with those who put pollution, despoiling the environment, destruction of the wilderness and national public lands foremost on their agenda. The Republicans in the House and Senate continue on their downhill rush to pass their so-called "tax reform" plan before the holiday break. It's a mad rush to nowhere, a corrupt process of "please the oligarch" that will cause a huge deficit increase (on the scale of $1 to $1.5 TRILLION over ten years) and be used by the Ryan, McConnell and Trump cadre of liars to justify a domino effect of Medicare, Medicaid, and Social Security cuts. It is class warfare of the one percent against everyone else. And it is being sold to the American people with a litany of falsehoods. Almost all the provisions in the bill are designed to be generous to the ultra wealthy and stingy to the middle class and poor. Corporations and their owners and managers--among the wealthiest people in the country--get the only permanent tax breaks. It's done in the name of competitiveness, but that's bunk. It essentially encourages corporations to continue to move profits out of the US because foreign profits are taxed at zero while US profits are taxed at 20%. It pretends that the multiple tax breaks for big corporations are necessary (under disproven trickle-down and supply-side theories) to lead to more investment in business in the US and to more jobs and higher pay for workers. But in fact corporations are enjoying record profits under current law and they aren't using those record profits to pay their workers more or to create more jobs or even necessarily to invest in the US. Mostly they are just doing share buybacks for shareholders (ie, owners/managers and other shareholders) that include the wealthiest people who own the most corporate stock. That's because it is demand, not capital, that determines what business expansion is needed and results in labor shortages that give workers leverage to demand more pay. Tax cuts for corporations just add to the already existing capital glut. The estate tax cut (elimination in the House bill; doubling the exemption to levels that only the very few multi-billionaires will pay any at all in the Senate) ensures that the wealthy will pay almost no tax at all. They borrow against their wealth while alive. Their estates pay no tax on the accumulated wealth when they die. Their children inherit with a "step up" in basis so they get a huge windfall. And their children can pay off the parents' debt by selling a few items (because of the basis step-up, with no taxes either) and live on their windfall without ever lifting a finger to do any real work. Individual workers really lose out in these bills. Under the House bill, the rate on the lowest wage earners is INCREASED 20%--from 10% to 12%. And all of the 'tax cuts' for ordinary taxpayers sunset after a few years, while the corporate cuts are permanent. Shows where the GOP loyalties lie--not to the worker base that put them in office, but to the wealthy oligarchs like the Koch Brothers who donate to the GOP political campaign chests. The pass-through provisions (a 23% "deduction" from income before tax is one version)--along with the ability of businesses but not individuals to deduct state and local taxes--are a great boon for wealthy owners of real estate partnership interests, like the Trump family. But they make no sense at all. The more different kinds of income categories that are created with different rates, the more you empower the wealthy to gamesmanship with the tax system. That's what this legislation does in spades. And after the American people spoke up in Town Hall after Town Hall that they wanted the Affordable Care Act health insurance system protected, the Senate's version of the so-called "tax reform" bill (developed in utter secrecy by Republicans bargaining with Republicans as though nobody else counts) eliminates the individual health insurance mandate (and accompanying penalty). Without that, the entire idea of affordable insurance through government-operated exchanges fails, because the only people on those exchanges will be those who are sick enough or old enough or vulnerable enough to realize that they will need health insurance soon. Insurance works by diversification of risk--that's why the Republican insurance plan in Massachusetts, the model for Obamacare, called for an individual mandate and penalty. Without that core feature, the exchanges can't work because the risk isn't sufficiently diversified. The Republicans who are trying to gut Obamacare know that, and apparently they don't care that this particular "tax cut" will in fact cost more than 8 million Americans the possibility of having affordable health care, likely leading to early deaths for a large number of that group. They don't care, I guess, because "those people" are less likely to be wealthy and less likely to vote Republican. If you are so blinded by partisan fealty that you no longer care about legislating for the good of the nation, you descend to the garbage dump level of this Republican tax bill. Of course, the elimination of the individual tax cuts, the expansion of the real-estate-industry favorable tax cuts, the inclusion of what can only be called a 'mock' provision to deal with carried interest (it doesn't), the elimination of the medical expense deduction (in the House bill) that will leave the disabled, the injured, and the elderly in dire straits, the decimation of the casualty loss provision that helps ordinary people recover from natural disasters, the huge cutback to the state and local tax deduction for individuals (while continuing to allow it for all businesses)--all these provisions prove that Republicans don't care a fig about ordinary people. We won't be spending money on basic scientific research (needed to be competitive in a global marketplace and needed to save lives from cancer and other diseases). We won't be spending money on infrastructure (needed to have safe roads, trains, airports. etc). We won't be spending money on education (other than Betsy DeVos's favored religious charter schools that teach falsehoods on a daily basis). We won't be creating a sustainable economy that serves all of our citizens. The passage of a tax bill that will create an additional one-to one-point-five trillion-dollar deficit is proof that the Republicans don't care if they destroy this country in their effort to return to the Gilded Age of the past (or, in Roy Moore's definition of the time that America was great, the slavery era when (white) families stayed together and were able to sell black babies away from their black mothers (or half white babies away from their raped black mothers)). What is the Republican response to the deficit and mal-distribution problems created by such a huge tax cut for the already wealthy? 1) The tax cut will pay for itself. This is trickle-down gobbledy-gook. The vast majority of economists and tax experts are quite clear that this is simply not a supportable claim. It's pie-in-the-sky ideology with no basis in fact when there have been a number of attempts to find such a basis. It wasn't true for Reagan, back in an economy for which tax cuts held much more promise of economic stimulus than they do for our current situation. The Kansas experiment shows this trickle-down reasoning is without foundation. Russell Berman, You Better Learn Our Lesson: Kansas Republicans say they are worried that Congress and the Trump administration will repeat the mistake they made in enacting budget-busting tax cuts, The Atlantic (Oct. 11, 2017). But Treasury has now put out a one-page analysis--compared to the careful, extensive, fact-based analyses usually prepared to support well-researched tax proposals--saying that the GOP plan would produce record growth and that growth would pay for the tax cuts. See Alan Rappeport and Jim Tankersley, Treasury Defends Tax Plan Cost with One-Page Analysis (Dec. 11, 2017). Event the speculative Treasury 'defense' assumes away half of the deficit with legislative cuts that aren't even on paper yet. It's pure fiction. 2) Medicare, Social Security, Medicaid (the "entitlement" programs) will have to be cut to make up for any deficits. That, of course, is the underlying plan. See Jeff Stein, Ryan says Republicans to target welfare, Medicare, Medicaid spending in 2018, New York Times (Dec. 5, 2017). Create a deficit and use it to 'starve the government' to justify cutting any programs that don't serve the oligarchs. Most of that minority of people who voted Trump into the presidency (assuming there wasn't a good bit of ballot falsification, which I think went on in Detroit to not count everyone's ballot) will suffer from this--they depend on Social Security when they retire and on Medicaid when they become incapacitated in their old age and need nursing home or assisted living care. Under the Republicans, we'll return to the "good old days" of the Great Depression when old folks became homeless and the government didn't have to bother with caring about the vulnerable. We all should be hitting the phones and telling every GOP member of Congress that they are not there to protect their wealthy donors: they are there to protect us and ensure that the economy is sustainable and viable for all of us. This tax legislation stinks. Tell Congress to ditch it in the sewers where it belongs.